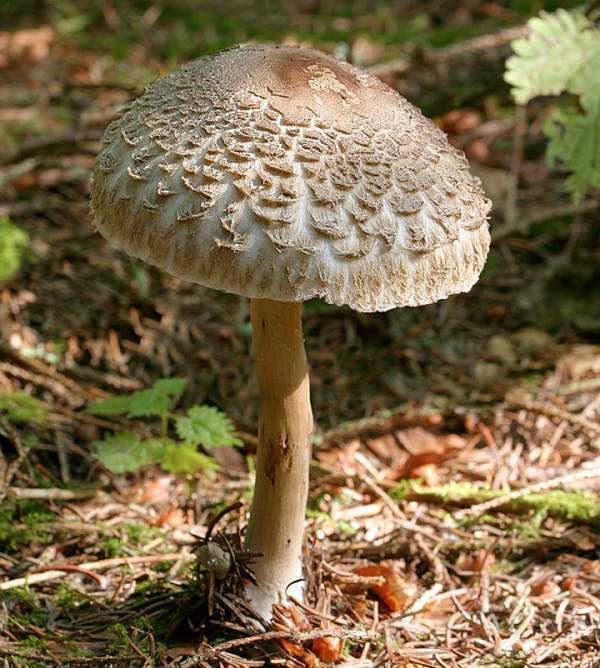 Frequent in Britain and Ireland, Shaggy Parasols occur throughout Europe and North America. 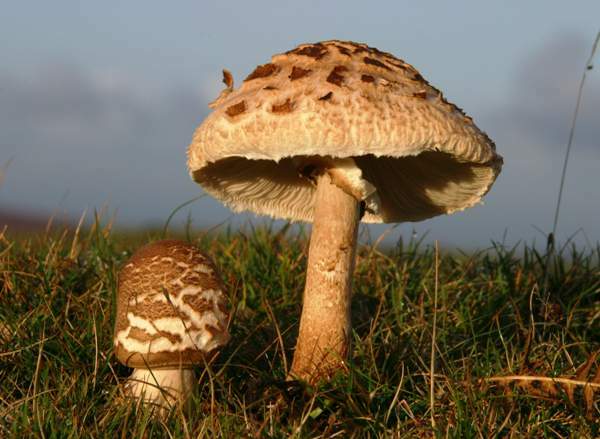 If you find fungi that look rather like Shaggy Parasols in open grassland, don't be too hasty in labelling them as such; there are several other large parasol-like fungi that appear occasionally in meadows, in dune grassland and in parkland. 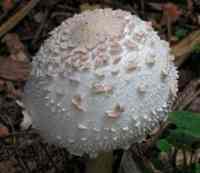 See also Agaricus augustus, commonly known as The Prince, as this large mushroom could also be mistaken for a Shaggy Parasol unless you look carefully at all of its identifying features. 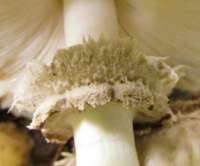 Taking a spore print (for which a mature fruitbody is necessary) would quickly resolve any such uncertainty, as the Shaggy Parasol produces very pale cream spores while Agaricus species produce dark brown or purplish-brown spores. 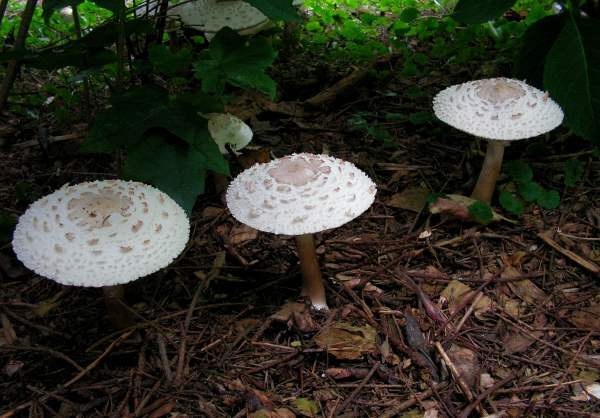 Described under the name Agaricus rhacodes by Carlo Vittadini (1800 - 1865) in 1835, this large and stocky mushroom has since spent time in the general Lepiota and Macrolepiota until, in 2002, DNA study by Else C Vellinga of the University of California justified its transportation to the genus Chlorophyllum. 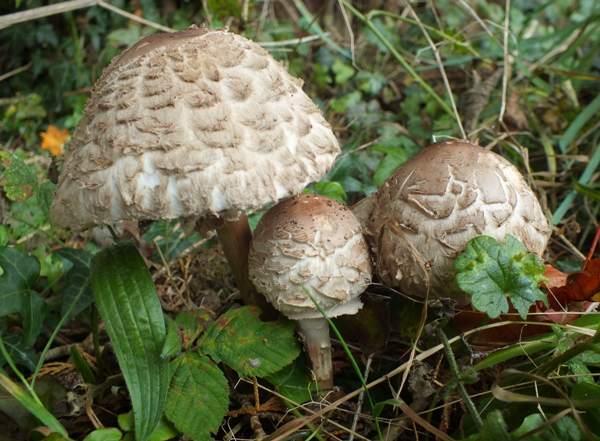 Common synonyms of Chlorophyllum rhacodes include Agaricus rhacodes Vittad., Lepiota rhacodes (Vittad.) Quél., Lepiota procera var. rhacodes (Vittad.) Massee, Macrolepiota rhacodes (Vittad.) Singer, and Macrolepiota venenata Bon. The generic name Chlorophyllum means 'with green gills' and is a reference to the green-gilled poisonous mushroom Chlorophyllum molybdites, which is common in North America. Other species in this genus have white spores, as indeed does Chlorophyllum rhacodes. 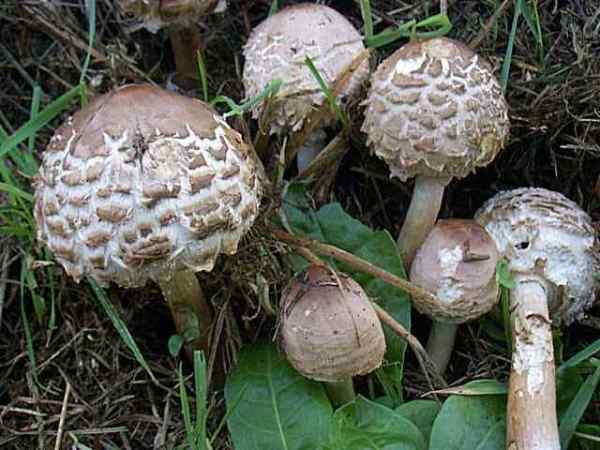 Many books and websites state that this is a good edible mushroom, but the Shaggy Parasol has been known to cause serious illness in some people and so picking it to eat, intentionally or otherwise, should be avoided. 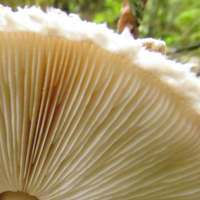 At maturity, the cap diameter ranges from 5 to 15cm; its flesh reddens when cut. The gills are soft, white, free and crowded. If the gills are bruised or cut, they turn reddish - as also does the cap flesh if it is cut. 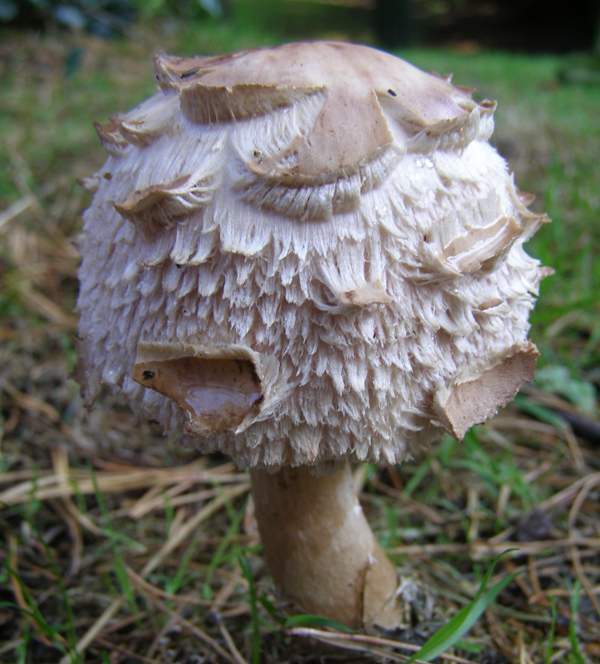 The stem of a Shaggy Parasol is white, tinged with red-brown, and it rises eccentrically from a large bulbous base. 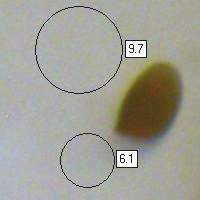 The stem diameter is between 1.8 and 2.4cm, and the stem flesh turns reddish when cut or bruised. A movable white double ring, the same colour as the stem, sometimes falls to the base as the fruitbody matures. 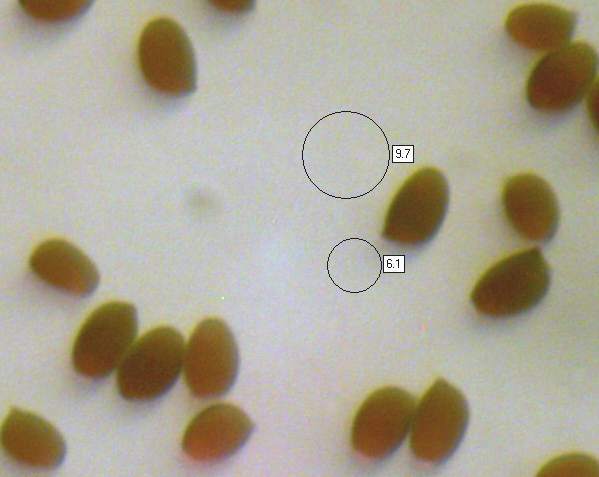 Broadly ellipsoidal to globose or pyriform (pear-shaped), smooth, 8.8-12.7 x 5.4-7.9 µm, with a germ pore; hyaline; dextrinoid. Taste not distinctive; odour quite pleasant. Chlorophyllum rhacodes is saprobic and occurs in all kinds of woodland and sometimes in humous-rich disturbed soil in gardens. 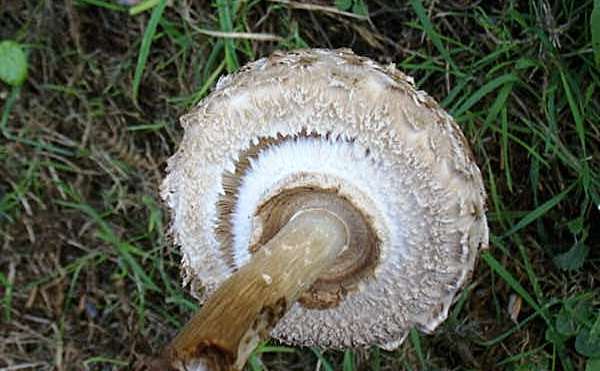 Macrolepiota procera, the Parasol, has smaller scales and a brown and white pattern, often like snakeskin, on the stem. Fascinated by Fungi, Pat O'Reilly, Published by First Nature, 2011. Elsa C Vellinga, de Kok RPJ, Bruns TD. (2003). Phylogeny and taxonomy of Macrolepiota (Agaricaceae). Mycologia 95 (3): pp 442–56.